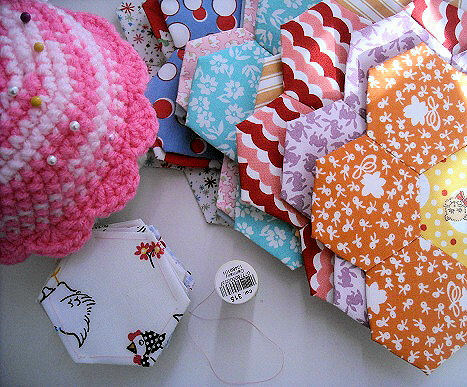 This weekend I didn't do anything besides clean and do tons of these paper pieced hexagons. I like hand sewing because I can lay on the couch with Artoo on my lap and watch TV while I do it, as opposed to being on the noisy machine in the uncomfortable chair facing the wall. I have 10 completed flowers so far, as well as all the pieces for 4 more. I'm not exactly sure what I want to do with all of them yet. 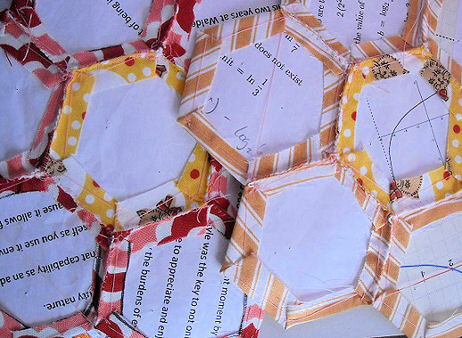 I may just keep making them and save them for some day when I feel like making a grandmother's garden quilt, or get impatient and sew them together and use it as a wall hanging. I'm leaning towards saving them, though. I love the idea of these going into a good heirloom piece, with my old reports and homework used as the paper inside. It was nice cutting up all of the stuff that I despised and caused me stress in the past week and crafting it into something I love.